In 2017, in a world fuelled by 24-hour news and social media, a world that constantly seems to teeter on the brink of all-out chaos, this is more apt than ever. It’s a world hungry for content at any cost, desperate for hits and clicks, driven by advertisers fuelled by their own political agendas. The term “fake news” has been bandied about a lot in the last few months, ever since it became the catch-cry of anything Donald Trump didn’t like in the 2016 election. But fake news has been around forever; what has changed is our ability to instantly share and be influenced by it. There is, however, a fine line between fake news and entrenched media bias, between clickbait intended purely to make some noise and a carefully orchestrated misrepresentation of the facts, something which has devastating and far-reaching consequences. 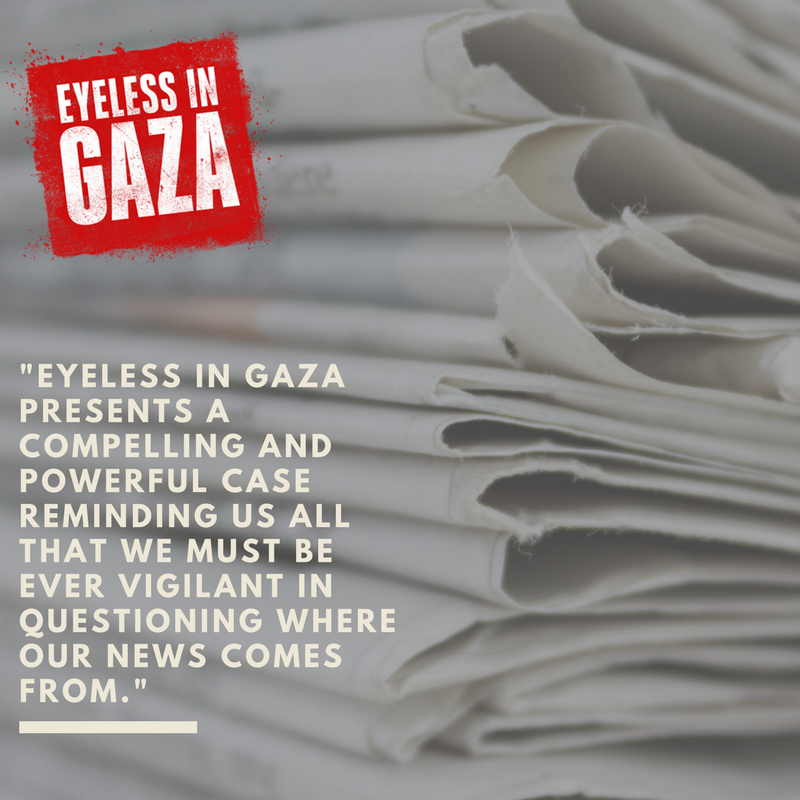 Delving deep into this murky world of media bias, Eyeless in Gaza is a courageous attempt to rewrite the narrative when it comes to Israel and Palestine, examining in particular the most recent instance their ongoing skirmish erupted into full-blown warfare in the summer of 2014. Too often, the film asserts, Israel has been branded as the aggressor by the world’s media in the bloody battle against Hamas. The film is painstakingly constructed and evenly balanced, featuring interviews not just with prominent Israelis but also with Palestinian civilians and journalists, Hamas leaders, military analysts and UN officials. It is clear – from those who are willing to talk – that we haven’t been told the full story. Instead, the film suggests that the media’s traditional bias against Israel combined with Hamas’ ability to control local coverage through threats and intimidation resulted in a staggering lack of honest reporting, incorrectly painting Israel as the well-funded bully to Palestine’s scrappy, defenceless underdog. Few would deny there are complex issues on both sides of this conflict, but what is also undeniable is that there is more to the story the simple hero/villain narrative the media has perhaps let us believe. In reality, it’s not quite as black and white. Whatever your perspective on the Israel/Palestine conflict, it’s important to recognise that the responsibility of the Fourth Estate is to seek out the truth and report it “without fear or favour”, as Adolph S Ochs implored. Eyeless in Gaza sheds light on this, on the entrenched prejudice within certain western news organisations and at the same time, the degree to which Hamas was able to control the media, by intimidating journalists deep within Gaza territory and threatening civilians for speaking out. One of these was Harry Fear, a British TV correspondent for RTV, who was thrown out of Gaza for tweeting that Hamas were firing rockets from within civilian areas. 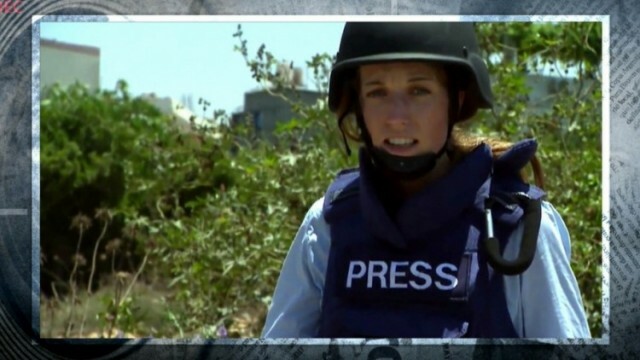 Others, like AAP reporter Matti Friedman, tell stories of waiting until they were safely out of Palestinian territory before filing any reports which may have been critical of Hamas. Combined with raw footage – video surveillance of Hamas fighters setting off rockets next to UN schools and people being used as human shields – the documentary paints a vivid and disturbing picture about the lengths to which Hamas – a democratically elected government, let’s remember – were willing to go to, even putting their own citizens in harm’s way. Eyeless In Gaza was produced by Robert Magid, a wearer of many hats including economist and property developer as well as filmmaker. He is also publisher of the Australian Jewish News. With that in mind, one might be quick to assume Magid has his own bias on this subject, though this assumption is unfair. True, he has a vested interest in Israeli-Palestinian relations, yet that interest comes from years living and working in the Middle East and observing its politics. He has a unique and valuable perspective on this complicated and divisive issue. The same can be said of his director, Martin Himel, who notched up 25 years in the Middle East both as a correspondent and then a bureau chief for a number of networks in the US and Canada. He’s since become an award-winning documentary maker for CNN, Sky and PBS. In other words, you can’t discredit the impeccable credentials of these two heavy-hitters. This is clearly an important subject they believe hasn’t been addressed, and one upon which they are more than capable of shedding light. Whatever your perspective on the Israel/Palestine conflict, it’s important to recognise that the responsibility of the Fourth Estate is to seek out the truth and report it “without fear or favour”, as Adolph S Ochs, the founding father of the New York Times once implored.